British food has not traditionally been regarded as one of the world's great cuisines, and yet Stilton cheese, Scottish raspberries, Goosnargh duck and Welsh lamb are internationally renowned and celebrated. And then there are all those dishes and recipes that inspire passionate loyalty among the initiated: Whitby lemon buns and banoffi pie, for example; pan haggerty and Henderson's relish. All are as integral a part of the country's landscape as green fields, rolling hills and rocky coastline. 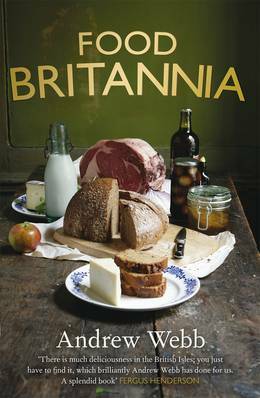 In Food Britannia, Andrew Webb travels the country to bring together a treasury of regional dishes, traditional recipes, outstanding ingredients and heroic local producers. He investigates the history of saffron farming in the UK, tastes the first whisky to be produced in Wales for one hundred years, and tracks down the New Forest's foremost expert on wild mushrooms. And along the way, he uncovers some historical surprises about our national cuisine. Did you know, for example, that the method for making clotted cream, that stalwart of the cream tea, was probably introduced from the Middle East? Or that our very own fish and chips may have started life as a Jewish-Portuguese dish? Or that Alfred Bird invented his famous custard powder because his wife couldn't eat eggs? The result is a rich and kaleidoscopic survey of a remarkably vibrant food scene, steeped in history but full of fresh ideas for the future: proof, if proof were needed, that British food has come of age.